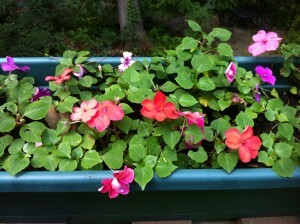 Last summer, my impatiens flowers were going gangbusters. The plants usually hit their peaks around July and August, filling my shady garden areas with their happy colorful blooms. Then, it hit. The disease that just might wipe out all impatiens for years to come. 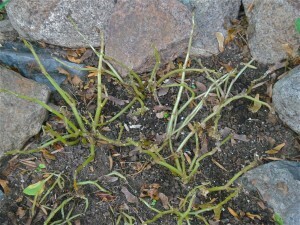 Suddenly, overnight, all of the flowers and leaves were dropped from the plants. 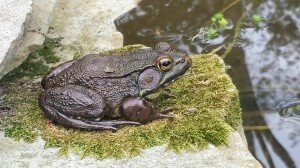 I first suspected slugs or another pesky insect. But then, my mother-in-law told me of her Garden Club’s latest news posting about the disease affecting my favorite shady flowering plants. I was wondering what to plant in place of them. Now, I’m talking about the impatiens that thrive in shady areas. 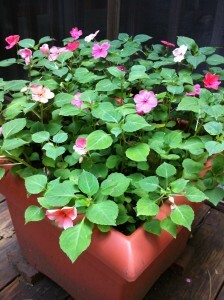 New Guinea impatiens love sunnier areas and so far are not affected by this shady plant disease. 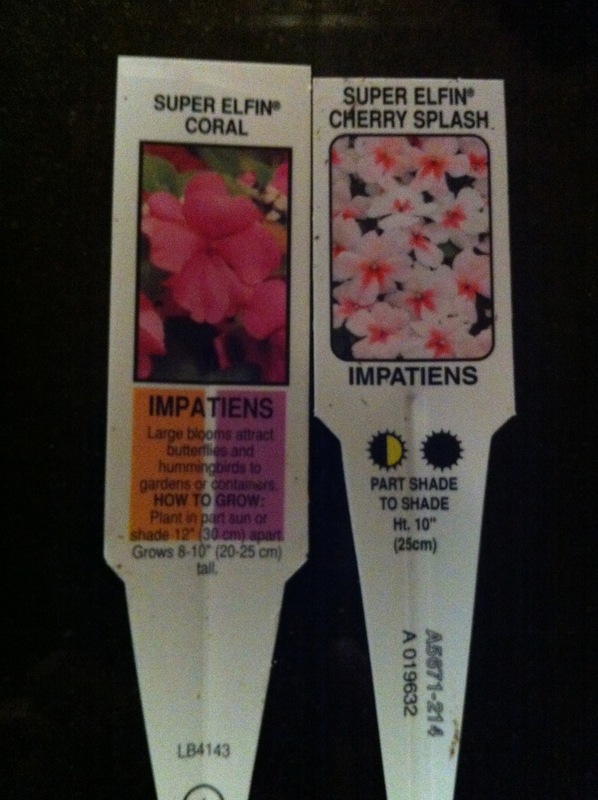 Usually, I will purchase a few flats of impatiens at my local garden center. I like to mass-plant two main coordinating colors for a sweep of pleasantry to the eye. 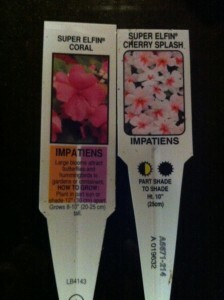 Last year, I purchased Super Elfin Cherry Splash and Super Elfin Coral. Additionally, some of the previous year’s plants will have overseeded and new little babies will pop up here and there in my landscape. 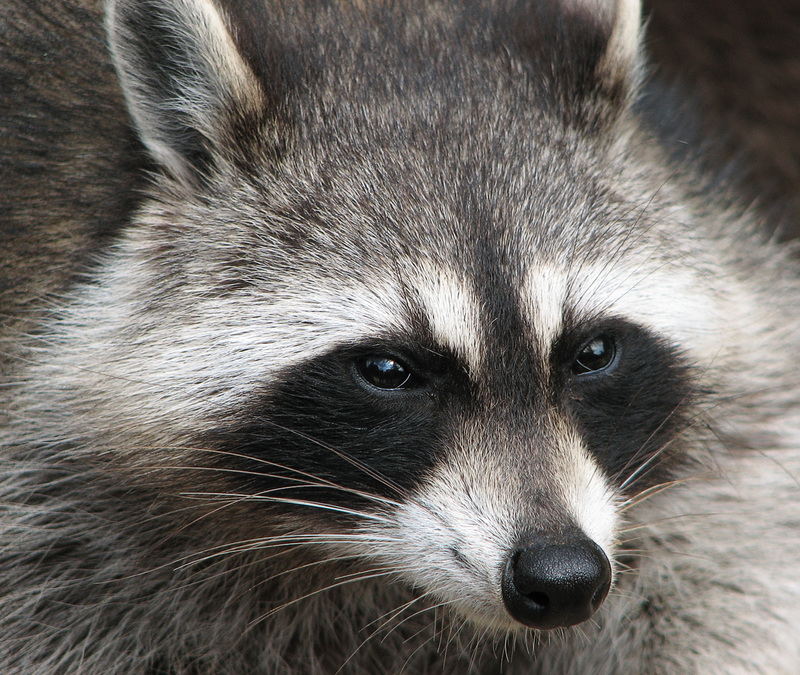 I’ve found that having more than two colors in one large expansive area can be too busy. 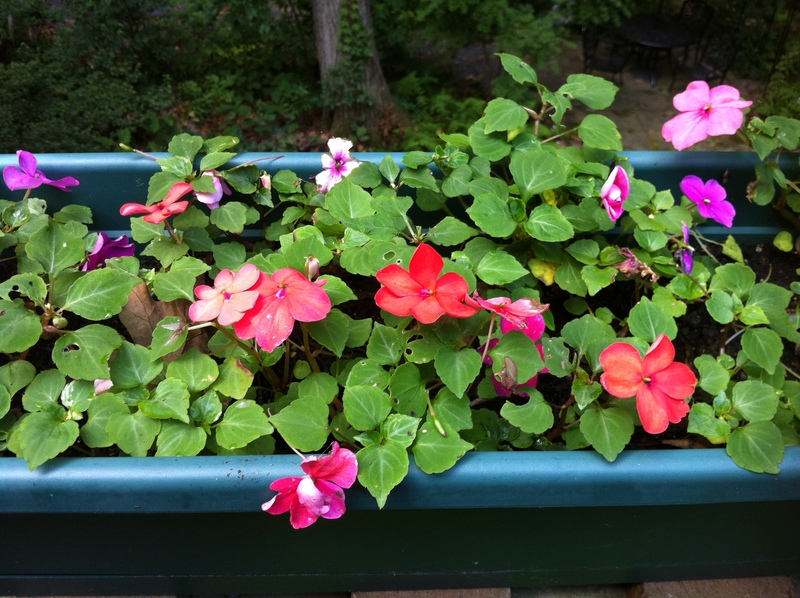 If you’re planting a single pot or planter, you can mix a number of colors together. Cherry Splash goes great with Coral! 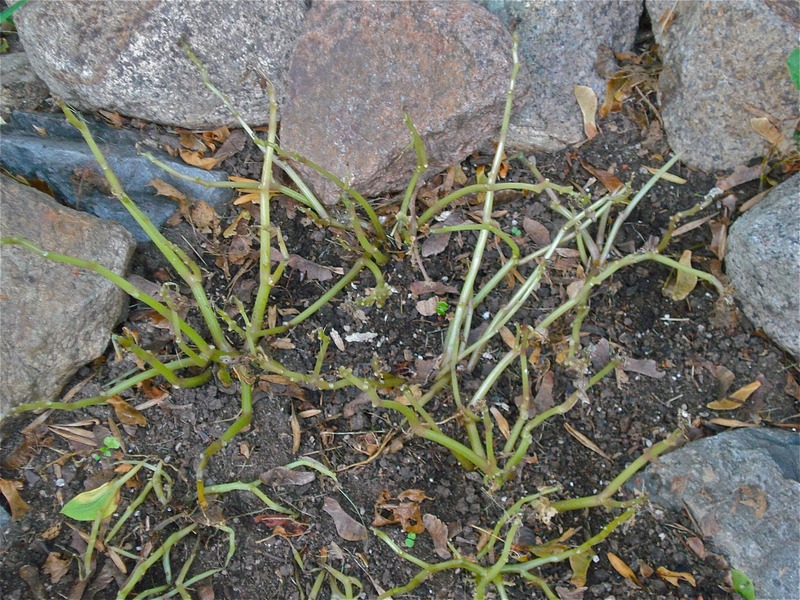 Generally, impatiens are not bothered by disease, and will flower until the first hard frost, or even flower year-round in warmer climates. Here in Virginia, planting after the last frost in May, they can be enjoyed up to Halloween! From what I can gather, the downy mildew disease started in Europe and has spread wildly across the US and other parts of the world. 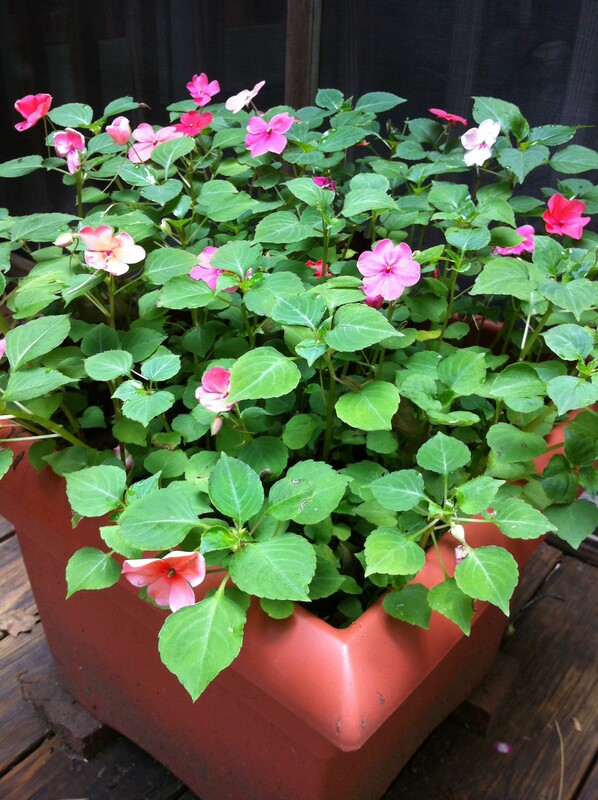 This planter rarely gets replanted due to Impatiens’ reseeding themselves! 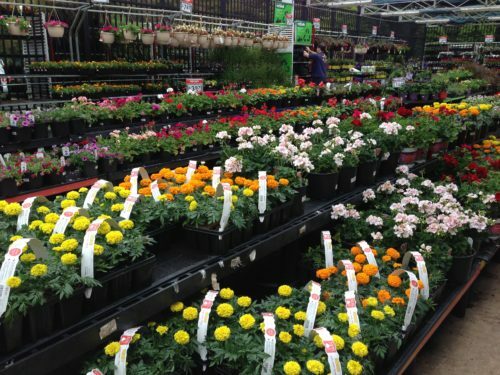 According to my local garden center’s experts, the disease will stay in the soil for a number of years, affecting newly planted seedlings and even established plants, as well as volunteers that have sprouted from last year’s seeds. 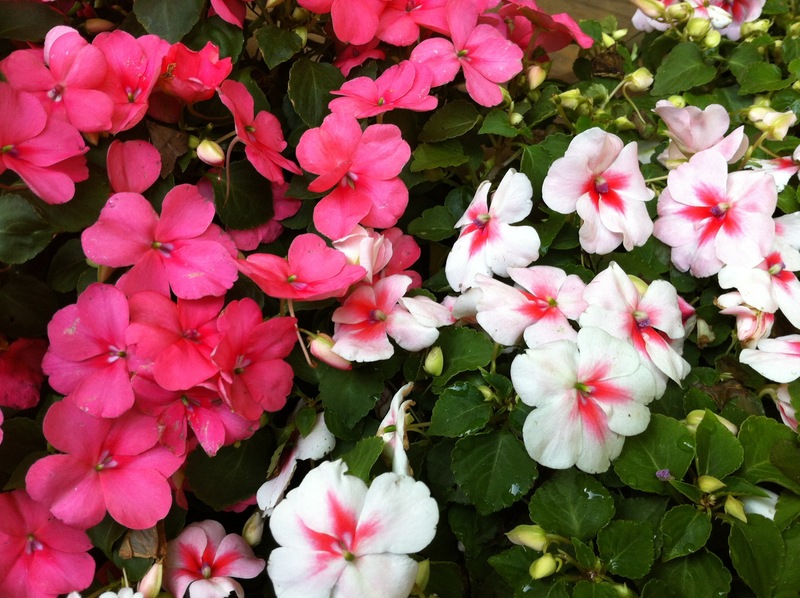 The experts are suggesting to plant something other than impatiens in my area for the next few summer seasons…and to get rid of the tainted soil, if possible. 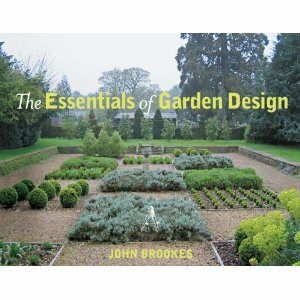 Also, you can read more about other colorful annuals in Add Instant Color to your Garden with Annuals. 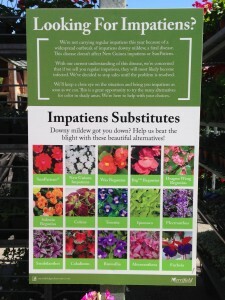 And see the suggested impatiens substitutes below which are posted at my favorite garden haunt, Merrifield Garden Center in Fairfax, VA.
Are you seeing the disease in your area? 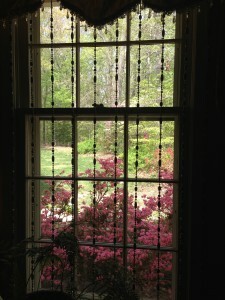 If so, what are you planting this Spring for shady color?